Typically for ages 4 to 8. 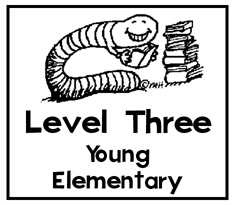 This category includes timeless stories that will appeal to a variety of ages; the books are more complex than Level 2 and usually have more text. Lessons are varied and often include suggestions for students working at different levels. Clip-art on this page licensed from the Clip Art Gallery on DiscoverySchool.com.